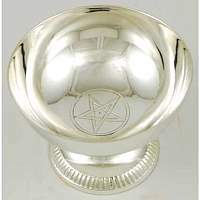 Pentagram Offering and Scrying Bowl is sculpted of silver-plated brass, this piece is an elegant solution to those looking for a new take on the traditional offering plate or scrying bowl. Created in a design akin to a chalice, it features a wide base that narrows to a slender neck before expanding to form the basin. 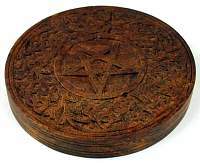 Its sides smooth and unadorned except for the pattern decorating the edge of its base, it flares out to a wide mouth with an open base decorated in a five pointed pentagram; a timeless symbol for the four elements united by divinity, or spirit. Standing approximately 3 inch high and measuring 4 inch wide, it is a squat piece that will not tip easily to spill its contents, and will readily contain all but the largest of your offerings. 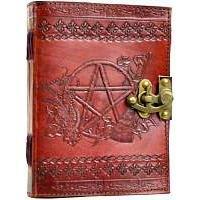 It could also easily be filled with a liquid of your choosing to gaze into for your scrying and divination.